Charles Burchfield's "Orion and the Moon" painted in 1917. Photo courtesy of the Burchfield Penny Art Center. The Hillstrom Museum of Art has received a $12,000 grant from the Carl and Verna Schmidt Foundation in support of the upcoming Charles Burchfield: Oh My Heavens exhibit opening November 19. The foundation, based in Rochester, Minn., supports organizations in Southwest Minnesota concentrating on arts, healthcare, and the environment. Director of the Hillstrom Museum of Art Donald Myers ’83 says the grant will help cover the costs of the exhibit including shipping charges and the exhibition fee. 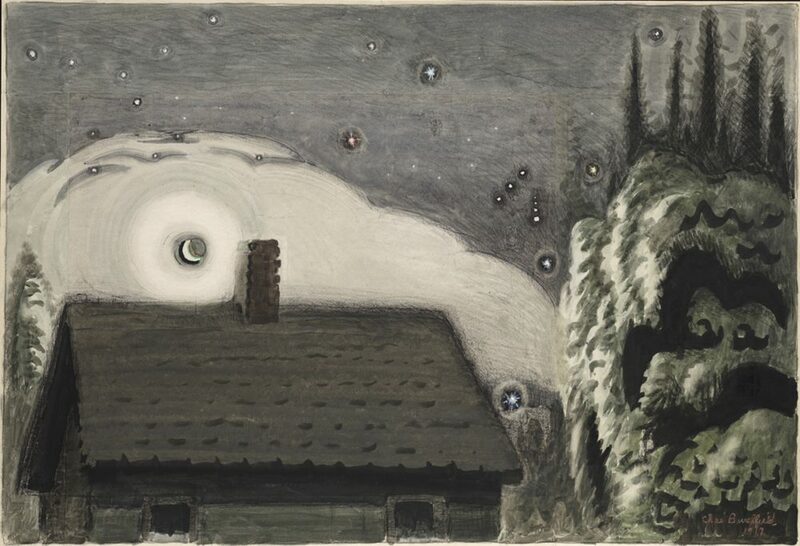 The exhibit will feature 50 pieces of Burchfield’s work focused around the skies and stars. Regarded as an American master painter of the 20th century, Burchfield is best known for his watercolor work featuring natural landscapes. The Hillstrom Museum of Art will be the collection’s first stop on a nationwide tour. While Charles Burchfield: Oh My Heavens does not open until mid November, the Hillstrom Museum of Art has a full schedule of exhibits throughout the school year. The first opens September 10 and features two exhibits, 10 AM, Zero One, and Other Settings: Paintings by Tony Martin as well as FOCUS IN/ON: Cameron Booth’s Toilers. For more information about upcoming exhibits, please visit the Hillstrom Museum of Art website.